World Heritage value forests nominated a fortnight ago by the Australian government for inclusion on the World Heritage register are still not safe and are being logged in secret, Tasmanian environment groups Still Wild Still Threatened, and Huon Valley Environment Centre and national group Markets For Change revealed today. A detailed report as well as film footage of the ongoing destruction, collected since the nomination, including the installation of new forestry gates to exclude the public was released by the groups. 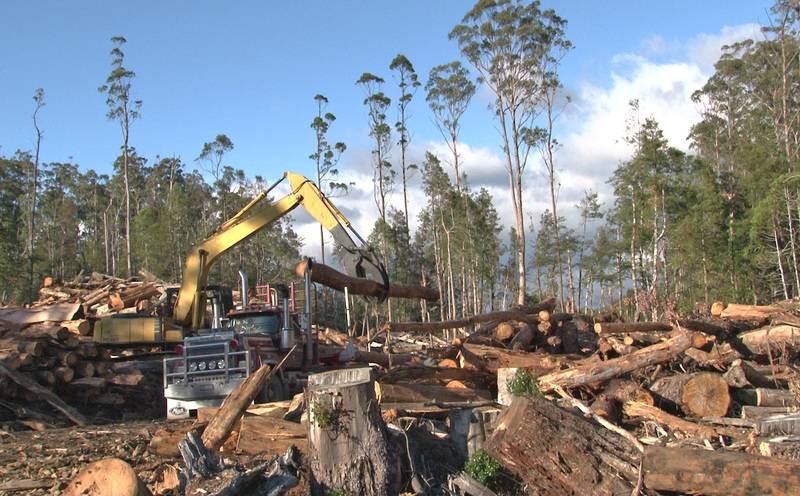 Footage also shows the threatened forests that have not yet seen a chainsaw, although Forestry Tasmania has plans to log the intact areas with the knowledge and apparent agreement of the Minister for the Environment, Tony Burke. An online action will today be launched from the Observer Tree through social media, where people can write to Prime Minister Julia Gillard and Environment Minister Tony Burke, asking for urgent action to halt the logging of the extraordinary values of the nominated World Heritage Value forests. Also a group of conservationists held a banner out the front of Canberra’s Parliament House this morning calling on Gillard and Burke, “You nominated the forests now stop the logging”. “When Minister Burke announced that the World Heritage nomination had gone to Paris I was overjoyed. Yet what he failed to announce was that the logging of these forests of global significance would continue. This is unacceptable and I am now compelled to remain in my tree sit until these forests are actually safe, as they should have been as soon as their values were put forward to the World Heritage Committee ,” said Miranda Gibson from the Observer Tree. Conservationists bring a messages from around the world to Canberra today. “Conservationists in Canberra today are bringing the voice of the global community to the Australian Government. They have displayed a banner that features over 300 images sent in from around the globe, as the international community called for the protection of these world heritage value forests. Many more people will continue to bring the message to Gillard and Burke through the online action,” said Ms Gibson. “The Australian government is abrogating its responsibility to protect the very World Heritage values they have nominated and many conservationists will be shocked that this could happen and angry that they have been kept in the dark about the continued logging. We are calling on the Federal Government to prevent any new logging from commencing and ensure that any current logging cease, so as to maintain the integrity and values of the World Heritage nominated forests.” said Jenny Weber of Huon Valley Environment Centre. These unique ecosystems in the Huon are on the schedule to supply timber to Ta Ann whose plywood flooring has already proved controversial in the Japanese market, which is another unacceptable source,” Jenny Weber said. “Companies selling Tasmanian wood products will now be receiving supplies coming from forests nominated for protection for their world heritage values, a confronting prospect when the markets are actually crying out for improved environmental performance,” said CEO of Markets For Change, Peg Putt. 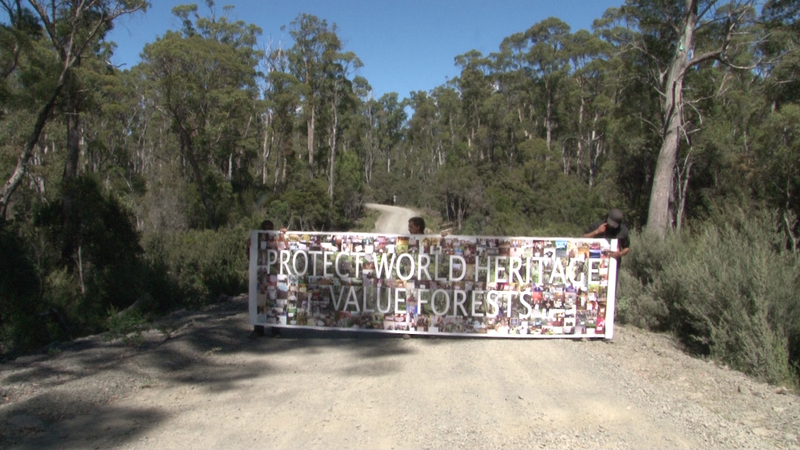 From the threatened forests of Butlers Gorge all the way to Parliament House in Canberra- this banner is sharing the messages of support from around the globe, calling for world heritage forest protection. Posted on February 14, 2013, in Media Releases, Photos. Bookmark the permalink. 7 Comments. It should be the timber markets, mad cow equivalent. Happy Valentine’s Day Miranda, hero of forests everywhere! Double standards! And the relentless power of the logging industry and wood buyers! Wouldn’t it be wonderful if these loggers turn into tour guides to show people from all over the world how special and important these forests are! You are a legend Miranda. Many thanks from us earth bound folk! What is Tony Burke’s problem? Was he never taught that when you say you will do something that is what you need to do?